When I first moved to New York City, my friends and I gathered for brunch every Sunday at Stingy Lulu’s, an Art Deco-styled diner in the East Village that was famed for drag-queen servers but, more recently (oh, my liver aches just to remember this), an all-you-can-drink brunch for a respectable low price. We ate at 1 p.m. each week, sometimes 1:30, never sooner. Breakfast before 1:30 p.m. was for old people, obviously. I ordered the same thing every single week- a frittata with feta, scallions, potatoes, and bacon, except I was still a vegetarian back then and had them hold the bacon. The addictiveness of this frittata, which I have seen nowhere since and thus have been forced to re-create in my own kitchen, should not be underestimated. 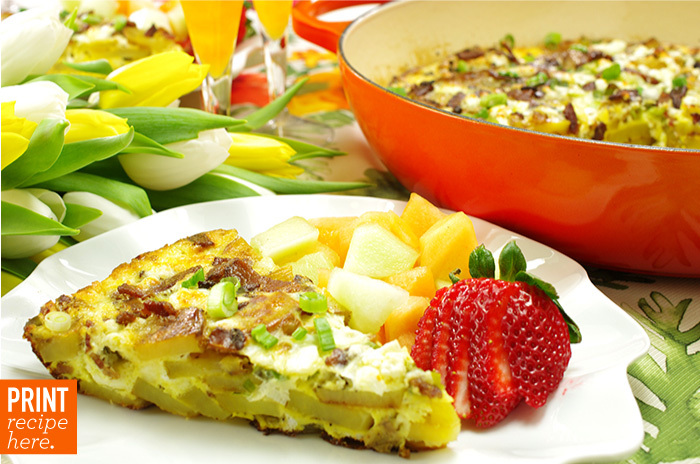 It is an all-in-one breakfast dish, and baked in a large frying pan, it easily serves a small crowd. I’ve replaced their red potatoes (surely, their leftover home fries) with discs of roasted-until-crisped buttery Yukon Golds. The scallions are wonderful, the bacon is great (especially if you can find the thicker-cut stuff), but the real magic is the feta. 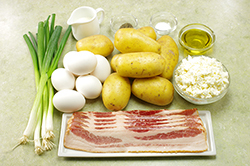 Feta, eggs, and potatoes go wonderfully together, I learned over a weekly series of watered-down mimosas; the sharp saltiness stands out in a way that cheeses chosen for their ability to melt into omelets do not. 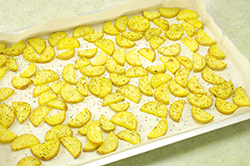 Cook Potatoes - Preheat your oven to 400 degrees. 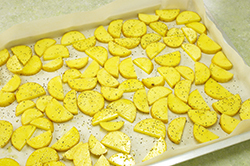 Coat a roasting pan or baking tray generously with oil, about 1 to 2 tablespoons. 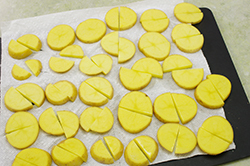 Peel potatoes, and cut them into 1/4 -to-1/2-inch slices, and then halve them lengthwise into half-circle shapes. Pile them in the prepared pan, and generously season them with salt and freshly ground black pepper. Don’t worry if they don’t fall into one layer –the combination of some steamy/softer and some crisp-edged potatoes will work great in this dish. Roast 30 minutes, or until potatoes are mostly cooked (they’ll finish cooking with the eggs), tossing once halfway through. Let cool slightly. Alternatively, you can place all of the potato slices in a saucepan and cover them with an inch of cold water. 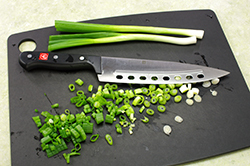 Bring to a simmer and cook slices for 5 to 7 minutes, or until tender but not falling apart. Drain, and let them cool slightly. 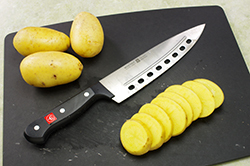 You won’t have the crisp edge on the potato but you will save a lot of time. 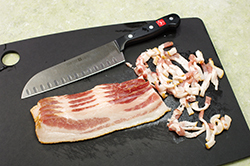 Cook Bacon and Prepare Pan - Cook bacon in well-seasoned 9-inch cast-iron frying pan until crisp. Scoop out with slotted spoon and drain on paper towels. 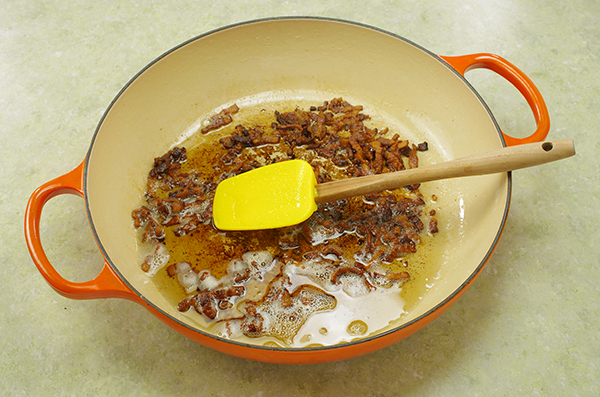 Add additional tablespoon oil to the bacon drippings in the pan, and reheat it over medium heat. Swirl the oil and drippings around in the pan and up the sides, being sure to coat it fully. 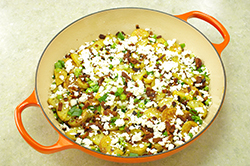 Assemble and Bake Frittata - Arrange roasted potatoes in your skillet. If there are pieces with browned undersides, I like to flip the toasty sides up, mostly because they will look bronzed and pretty. 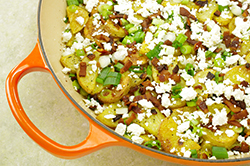 Scatter bacon, then scallions and feta over potatoes. 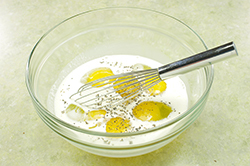 Whisk eggs with milk, 1/2 teaspoon salt, and several grinds of black pepper in a medium bowl, and pour over potatoes. Cover skillet with foil, and bake for 20 minutes. Remove foil, and bake for another 10 to 15 minutes, or until puffed at edges and set in center. To Serve - Serve right from the skillet, in 6 to 8 wedges. Recipes from The Smitten Kitchen Cookbook by Deb Perelman. Copyright 2012. Published by Alfred A. Knopf, a division of Random House, New York, NY. Reprinted with permission of the publisher. All rights reserved.